All You Need to Know About Black Truffle Oil | Montreal Food Importer & Distributor | Exclusive Importer of Citterio in Canada | Macchi Inc. The product I picked to present to you this week has caused a lot of controversy over the years. Mainly because it has been portrayed as something different than it is, but it has always been very appreciated when consumed in all of its different ways of preparation. I will, this week, make sure that there is no more confusion with regards to this very useful product and also let you know why I love to use it in my cooking and savor it in cooking prepared by professionals. Introducing the Black Truffle Oil: ‘A bath of gold’! I stumbled over many articles, as I did a search on the web for Truffle Oil, just to see how others had used it and also to see what their opinion was, as I do with every week’s product. To my surprise, there was a lot of upset because people had been wrongfully informed. 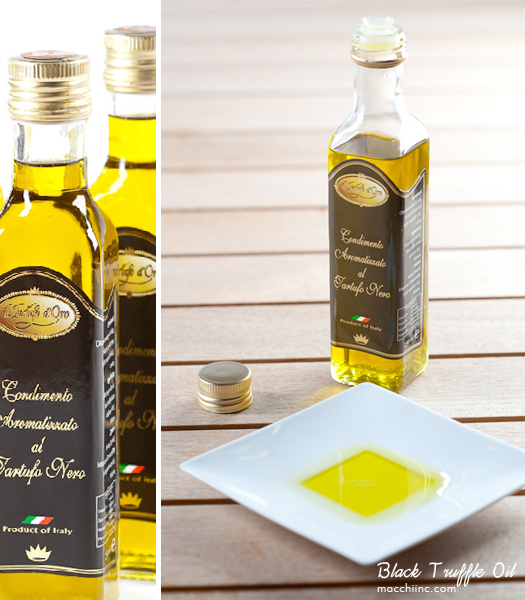 The Truffle Oil that we sell here at Macchi Inc., is Olive oil infused with truffle essence, meaning that it is artificially flavored and in our case also flavored with real truffles and It is made on the highest quality of EVOO (Extra Virgin Olive oil). Just as there is different kind of truffles, there is also different kind of truffle oils, we supply you with white winter truffle oil and the black summer truffle oil. Can truffle oil be used to replace truffles? Never! But it can most definately be considered as a truffle- or truffled product. Considering it is based on olive oil, we all know what an aromatic and strong flavored oil olive oil is. Also I shouldn’t forget to mention when not fried in, how healthy it is for you! So no matter what flavors or essences that are infused in the oil, it will mix and make it’s own flavor and in my opinion a really good one! Our truffle oil comes in 250 ml bottles and retails for around 30$ per bottle. The bottle is labeled as “il tartufo d’oro”. This truffle oil adds a slightly sweet and earthy flavor to your dish and a heavenly aroma. As always I am very interested to know what your thoughts are and if you’ve had the opportunity to taste or use truffle oil, don’t hesitate to share it with me. I love truffle oil on baked potatoes, fresh pasta and even on corn on the cob! It’s also great on popcorn with a cocktail, as they do at Per Se. And here I am thinking that I have used it on everything. I love corn on the cob and baked potatoes, I will defenately give both a try. J’utilise l’huile de truffe depuis au moins 5 ans, sur les oeufs, sur les champignons et a spritz tartare de saumon. Delightfull!! Diane, isn’t it amazing how it works well with so much! slow roast for 1:25 hr. at 350 degrees . Rest for 20 min. I am quite happy I found your blog & twitter account. I love reading about new things. I always have been intrigued by truffles. I saw some truffle oil on sale at Borough Market in London UK but did not buy. A month ago I had a pumkin/butternut squash soup at a friend. She added some Borough Market truffle oil on top and it was heaven! Since I have bought some white truffle oil here in Montreal (La folie en Vrac) but it is aromistised and does not taste strong at all. It also might be because it is a white truffle one, I dont know. But I realise the quality of your dish depends a lot on the quality of the truffle oil. Are dark truffle oil stronger than the white? Where could I buy a good truffle oil here in Montreal? (I live on the plateau). I so regret not adding some truffle oil from Borough market when I moved here 3 weeks ago.